The interview process can be quite trying. There are those interviewers whose questions are directed to find out what is wrong with the candidate. These are the half-empty managers. They have limited vision and poor managerial skills. Then there are those managers who want to find out what the candidate has going for her/him and how s/he can contribute to the organization. Those are the half-full managers. They are the ones who know how to make things work and get them to work better. The same goes for being able to appreciate ideas. 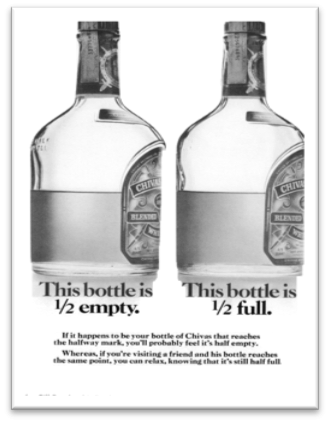 Like the half-empty interviewer, the half-empty marketer only sees what’s wrong. The glass is half-empty. S/he will resort to full “evaluator” mode and point out all the things s/he doesn’t like. As a result, an idea fragment, which may become the seed that blossoms into a potentially powerful initiative (regardless of whether that is a promotion, advertising, product improvement, etc. ), is DOA – Dead On Arrival. It’s killed before it can be born and its potential realized. There’s no vision for what can be, only for what is wrong. The fact of the matter is that many ideas that work in the marketplace are only partially baked when first presented. It takes someone with vision, and who is looking for potential (as in the glass is half-full), to spot it and identify ways in which it may be made more productive. That’s where the half-full marketing manager comes in and creates impact. The half-full marketer will look to find the merit inherent in an idea. S/he will see potential in an idea fragment. Importantly, instead of throwing out a litany of dislikes, or reasons why the idea will not work, s/he provides solid direction as to what is needed to realize the potential of the idea. This direction is not prescriptive, such as “say this in the key copy words,” but “I need to see the benefit captured in the key copy words.” This is what is referred to as “coaching” and it is entirely different than criticizing (despite conducting a “critical analysis”). I wouldn’t want to be interviewed by a half-empty manager, nor would I want to share my ideas with her/him. Half-empty managers are short sighted and downers. They do little to inspire others, or themselves, to create impact in the marketplace.